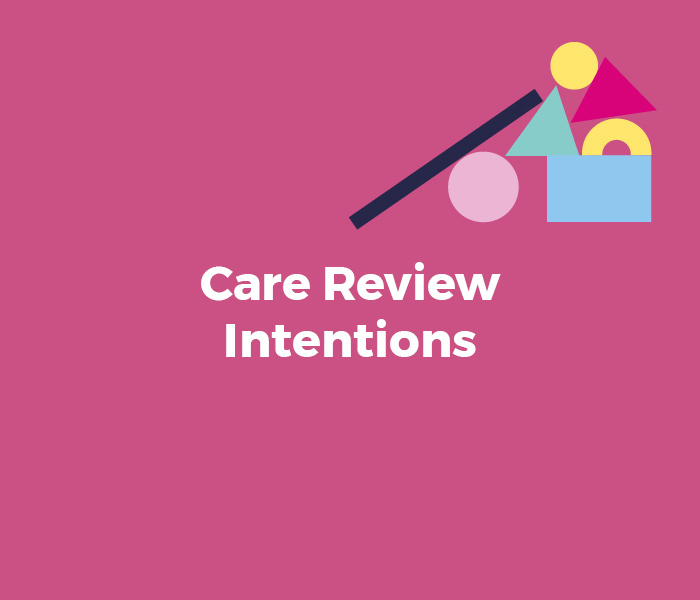 The Care Review Intentions emerged from what was heard and understood over a whole year of engagement and activities with children and young people who have experienced care, and the people and organisations who work in the ‘care system’. They will be used to guide the work in the Journey stage. The Intentions are based on analysis of a wide range of views and care experienced voices, however, it was clear that there was a lot of common ground in what children and young people said and the views of the workforce. The Care Review worked with a Go-to group of 62 children, young people and adults who have care experience to ensure that the plans for the next stage made sense and reflected the scope of all the issues that mattered most to them. Over 60% of the group had not spoken to the Care Review during Discovery and so brought new perspectives and views, therefore preventing an echo chamber. Through group work, one-to-one sessions and video chats using FaceTime, the Go-to group worked with members of the Care Review team to reach agreement on how to revise and improve the Intentions along with a plan for how the Care Review will take these forward into the Journey stage. Thanks to everyone that took part in this critical part of planning for the next stage of the Care Review! Members of the Go-to group provided the voiceovers to their own words in the Intentions video below. Scotland’s infants, children and young people will be nurtured, loved and cared for in ways that meet their unique needs. Care experienced infants, children and young people will thrive in supportive and stable learning and work environments, ensuring they have the same opportunities as others. Aftercare will be designed around the needs of the person leaving care supporting them to lead a fulfilling life, for as long as they need it. Infants, children and young people’s rights will be part of normal everyday life, practice and decision making. Infants, children and young people’s voices will have a visible and meaningful impact on decision making and care planning. All adults involved in the care of infants, children and young people are empowered, valued and equipped to deliver the best care system in the world. Scotland’s care services will plan and work better together, sharing information more easily to ensure we understand the what and how of supporting infants, children, young people and their families from a local through to a national level. Scotland will understand the financial and human cost of care, including what happens when people don’t get the help they need. The words used to describe care will be easily understood, positive and not create or compound stigma. There will be no stigma for infants, children and young people in care because Scotland will understand why our children need care.